A 3-year-old girl from North Carolina has been missing since Monday morning. Authorities in North Carolina are asking for the public's assistance for information to aid in the search of a 3-year-old girl who disappeared from her home Sunday night. Mariah Woods was last seen at her Jacksonville, North Carolina home Sunday night by her mother, who put her to bed, North Carolina ABC affiliate WCTI reported. Officials would not confirm those details to reporters during a press conference Tuesday afternoon in order to protect the integrity of the investigation. "We know what the answer is, but we won’t reveal it at this point," said Onslow County Sheriff Hans Miller. 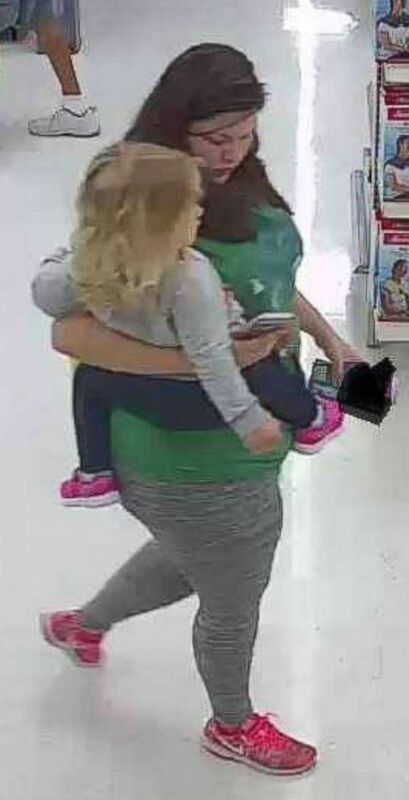 The Onslow County Sheriff's Office and the FBI overnight Wednesday released surveillance pictures taken Monday morning of a woman and child at a North Carolina Walmart. They are attempting to determine whether the child is Mariah Woods and are asking for the public's help in identifying both the woman and child. (FBI/ONSLOW COUNTY SHERIFF) The FBI and Onslow County Sheriff's Office is looking for help in identifying the woman and child in this photo in connection with the search for missing toddler Mariah Woods. FBI Special Agent-in-Charge Stanley Meador said investigators are especially interested to speak to "anyone who has had contact with the family" since Sunday, while Miller said that any clue, such as children's clothes, can be helpful. "We will explore every investigative lead that comes to our attention," Miller said. Miller assured the public that authorities were using "every available resource" to search for Mariah, including drones as well as helicopters provided by the Marine Corps, the North Carolina State Highway Patrol and a neighboring sheriff's department. The first priority is to find Mariah, bring her back and then find out what happened to her, Miller said. After Mariah's disappearance, her mother, Kristy Woods, reached out to the public with an emotion-filled plea. “Please, bring her back ... my baby. She’s my everything,” said Woods. “Just to be able to touch her and hold her and not let her go again, I’d give anything." An amber alert was issued for Mariah soon after she was reported missing at approximately 6 a.m., according to Jacksonville Sheriff Hans Miller. Mariah is described as a white female with brown hair and blue eyes, about 2 feet, 9 inches tall and weighing 30 pounds. "[Officials are] working everything that can be worked to find this little girl,” Miller said Monday. Four volunteer fire departments, the Onslow County Sherriff’s Department and K9 units conducted a search in the wooded area behind the girl’s home as well as surrounding wooded areas, WCTI reported. "We don’t know what happened," Miller said Monday. "It’s entirely premature to try to determine what happened." Miller said they will continue to search in "expanding circles" as the investigation continues. Mariah's biological father, Alex Woods, expressed skepticism about his daughter's disappearance when speaking to WCTI. "For someone to just walk right up in there, grab the 3-year-old out of bed, she didn't cry, she didn't scream, nobody heard nothing?" Alex Woods said. "Four people in the house, two adults and two kids. Somebody just comes up and snatches baby and walks out?"